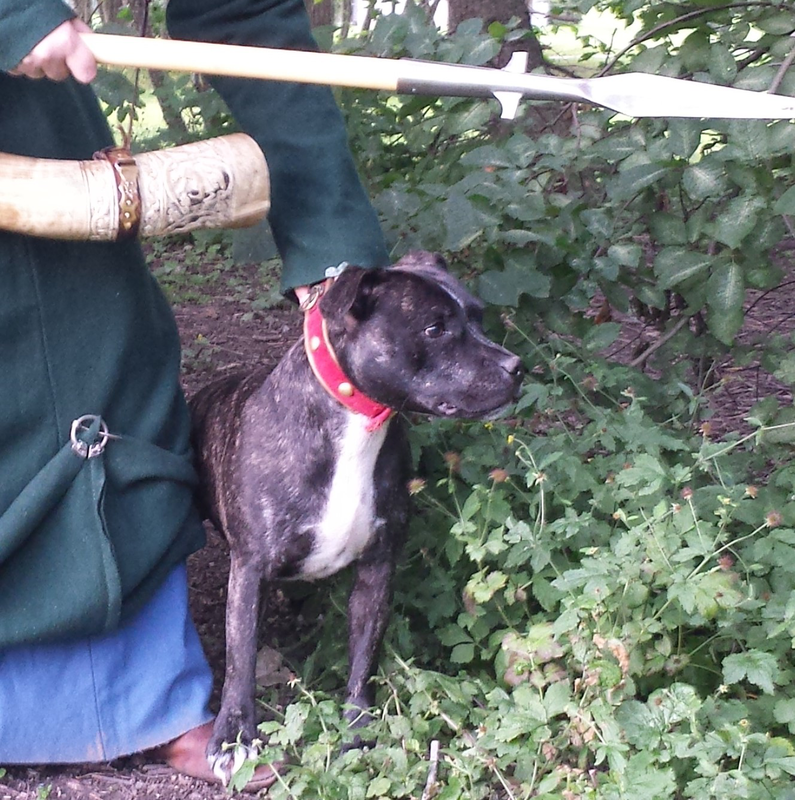 It is now time to take a look on what tools was thought to be needed for handling the dogs during the middleages. 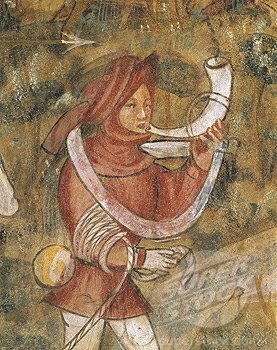 This article will concern mostly late 14:th and early 15:th century, but some offshoots might occur to other times. Like always we lean heavily, or maybe all on, the tools used in the hunt. 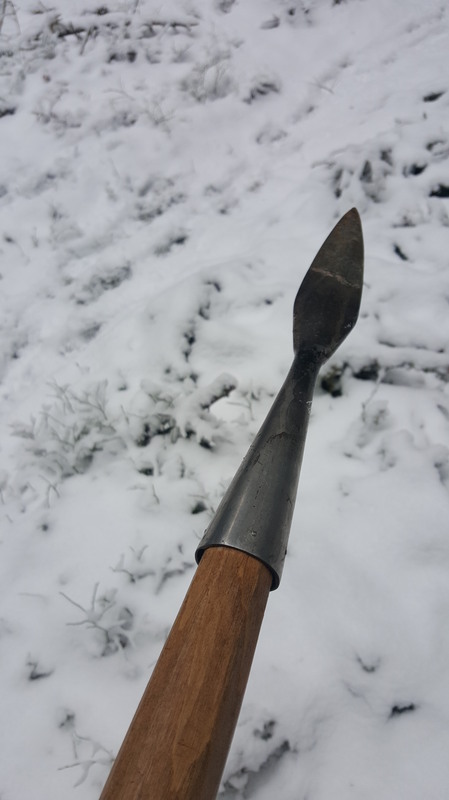 We will use archaeological finds, textual evidence, illuminations and sculptures to get into the nuts and bolts of the medieval doghandlingtools and how they where used. Words and meanings of expressions you can get an explanation to in the article about the medieval dog, here. 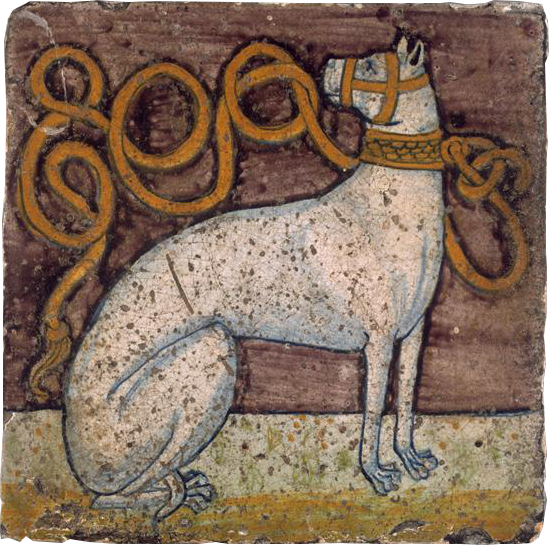 The use of the words ‘dog’ and ‘hound’ is here used in the medieval way, where there was no bigger distinction between the two. The both meant rather the same back then. 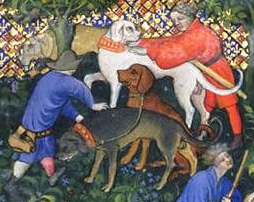 The man handling the dogs where called a ‘berner’ or ‘Valet de chiens’. If he was the one using a limer he was reffered to as ‘lymerer’. The berner in charge of greyhounds was sometimes called a ‘feweter’ or ‘veltrahus’ in gallo-latin. Needless to say, doghandling was something that was though of as a craft. 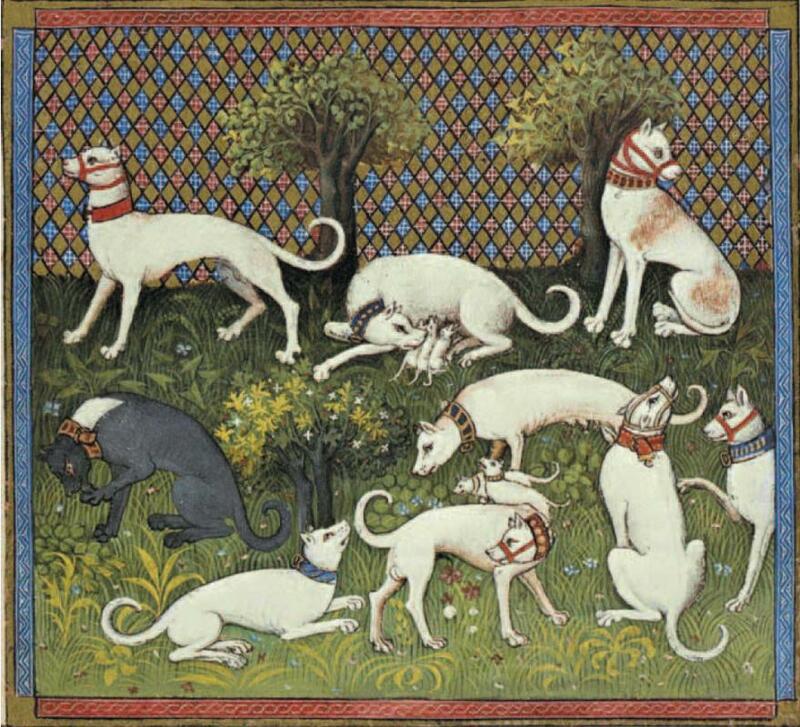 The doghandlers where supposed to memorise the names and characteristics of the dogs, hear in the way they bayed if they where on the track, had lost track, or where standing the game. 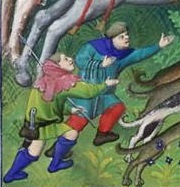 The collars of the middleages where sometimes highly decorated. Showing the high value you put on the dog. 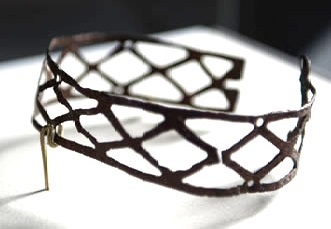 The more run of the mill collars where simpler, but it seems that leather and textile are the most common. 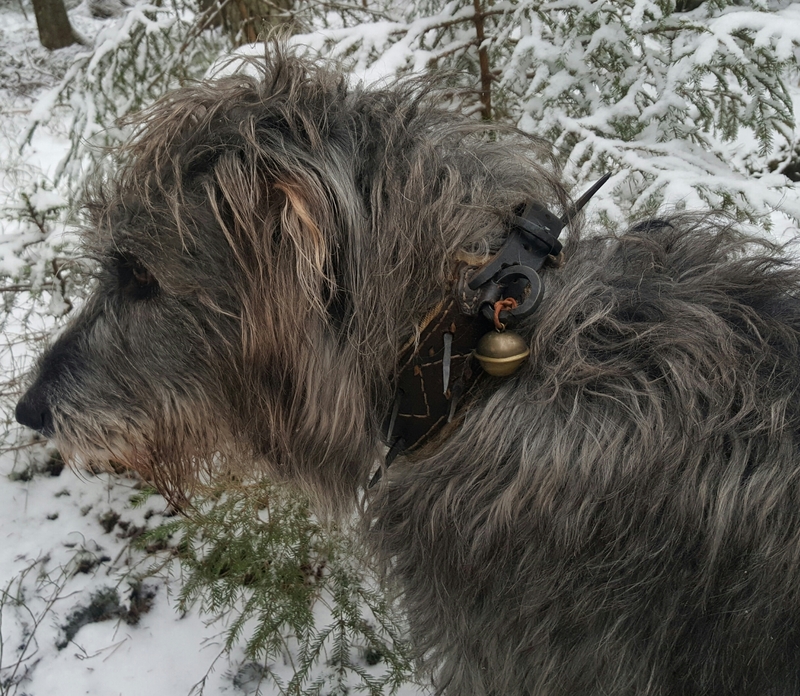 There are also special collars for different purposes. 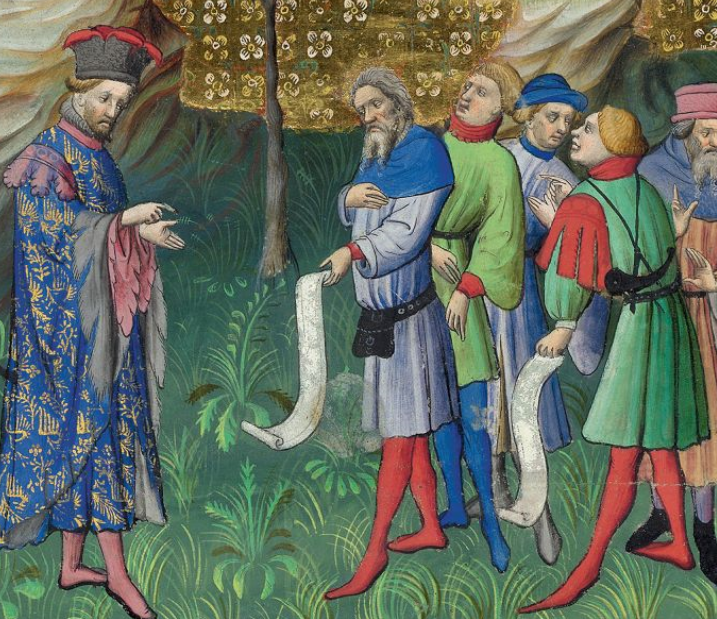 ♦ Regular collars In illuminations (medieval book illustrations) most collars are red with golden studs. Some blue, black and one or two green also appears. Most probable these are made out of leather, but some might as well be textile. Most seem to be of the non choke kind, and uses one buckle to close it. 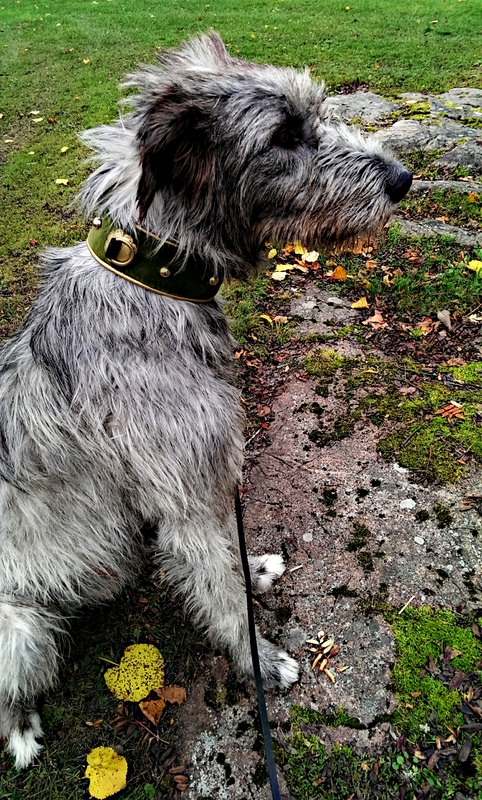 Other kinds of collars seems to use two buckles and a swivel for the leash between them. 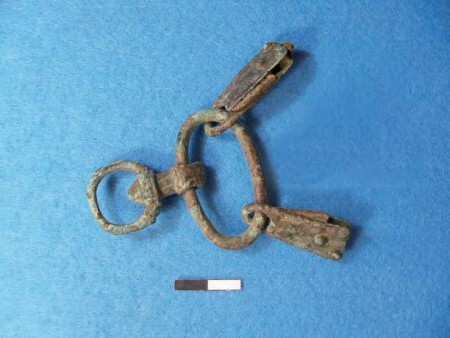 finds of the buckles and swivels are sometimes made. They can also be seen on illuminations and paintings. 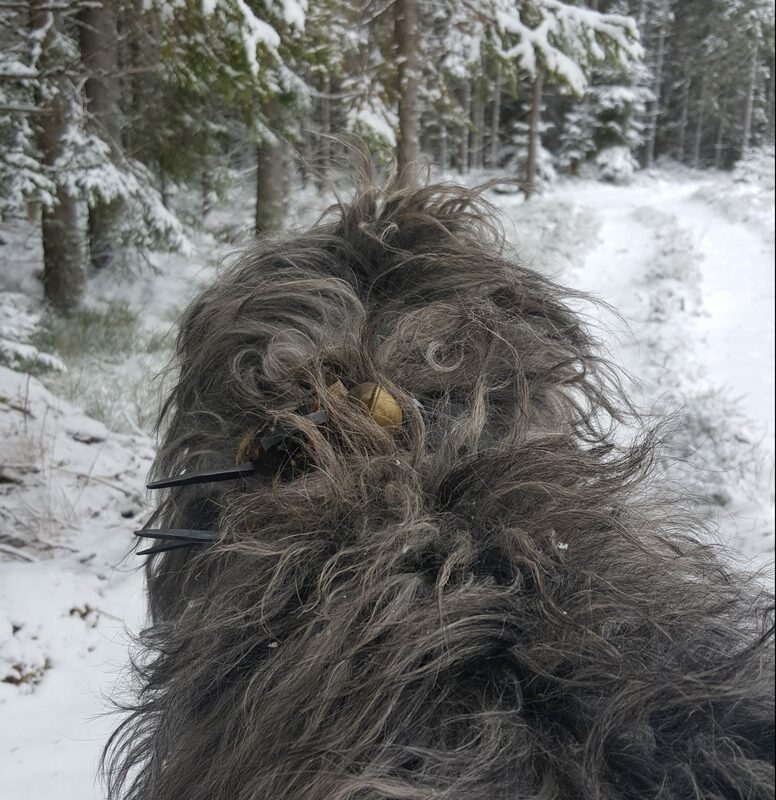 Wolfcollars are collars with big spikes protruding from them. 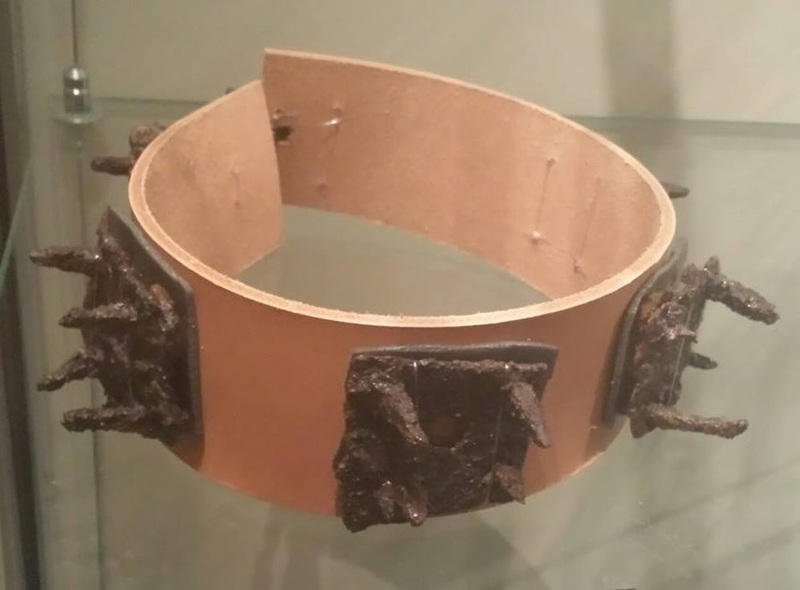 Wolfcollar of unknown date. resembles ones in illuminations. 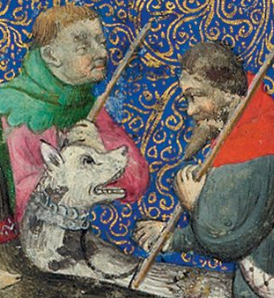 The purpose of these are that the wolf should not be able to close its jaws over the throat/neck of the dog. The spikes do not have to be sharp for this, but many wolfcollars have very sharp spikes indeed. 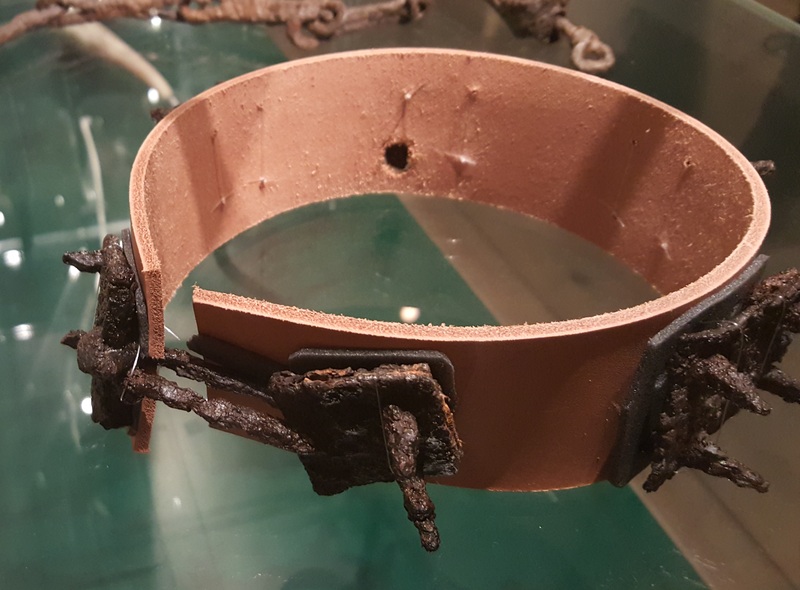 These collars was worn by dogs hunting wolf. 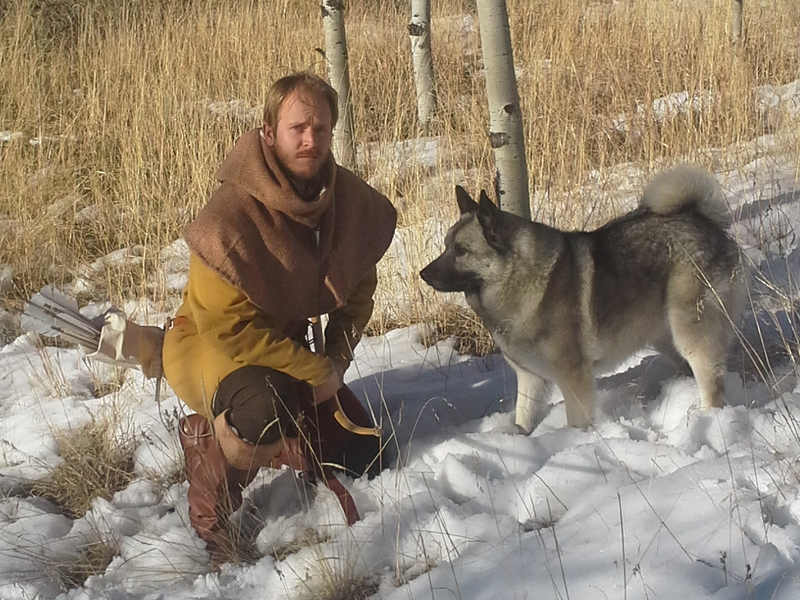 Also, and maybe more common, they are worn by dogs guarding cattle or sheep against wolves. 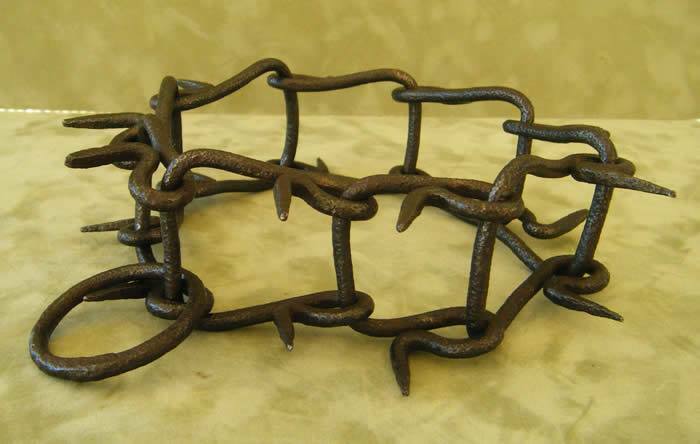 Some common wolfcollar seems to have been made of linked metal-chains with spikes. These may, or may not have been backed by leather. Others seems to have the spikes fastened on a leather or textile collar. I choose to make one of the leather versions, backed with several layers of canvas. To stop the spikes from being pushed backwards and chafing the neck the canvas was stitched in ‘compartments’ around the spikes. The spikes themselves are roughly forged on just an anvil and have large flat heads. 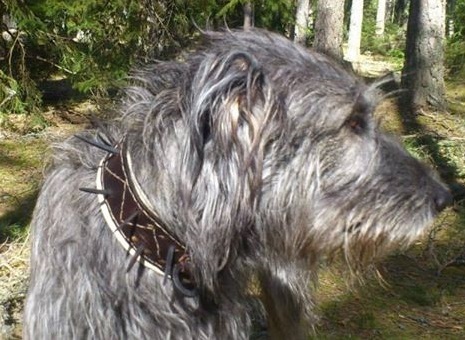 There is some uncertainty around the use of mailcollars to protect the dogs. These would predominantly have been used in boarbaiting I am guessing. 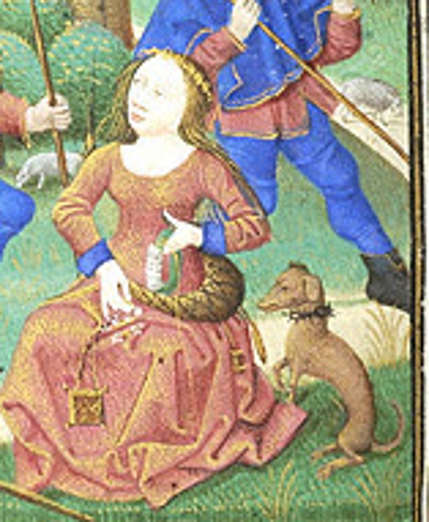 There are some pictorial evidence that might suggest mailcollars or collars of scales. 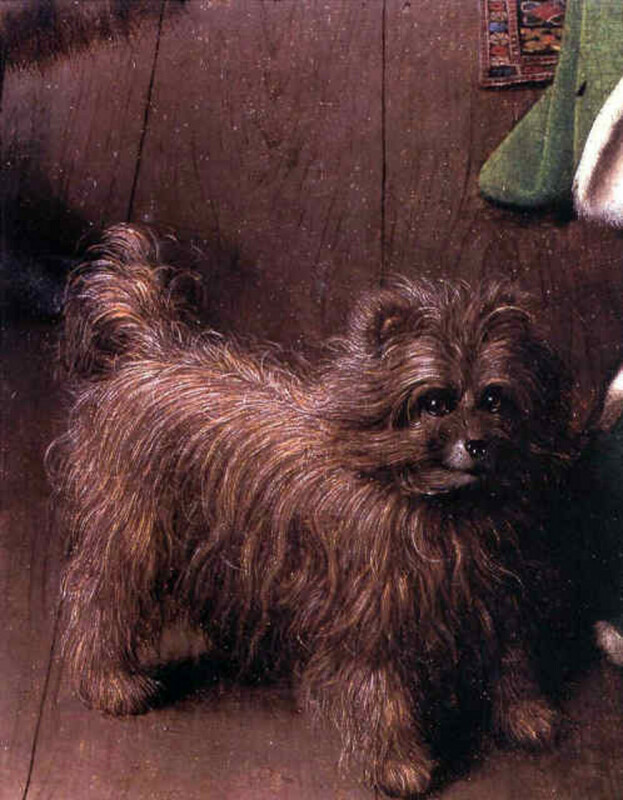 They are portrayed on alaunt and mastiff like hounds and therefore hounds that would have been used for boarbaiting. But I have not seen any mentioning of them in text. 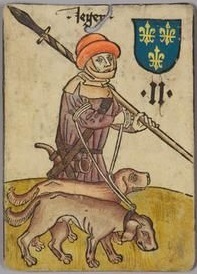 As all sorts of hounds could be used in boarhunting, my guess is all kinds of dogs could wear them. The need of holding on to the dog has been ever present. The leash was mostly of two kinds, the couple and the liam. 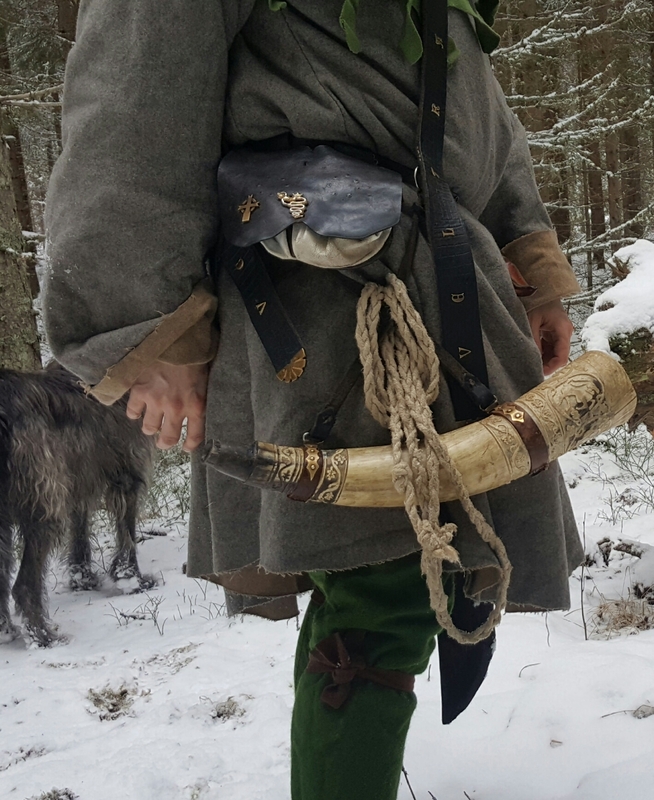 When the leash was not in use it was commonly hung on the arm, or in some cases the huntinghorn, or tucked into the belt. 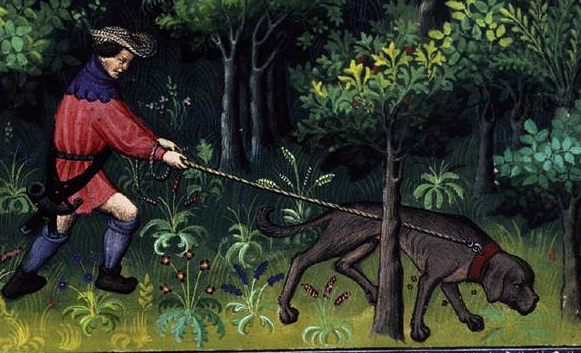 A liam, lyome, or fyame, is an old Word for leash. 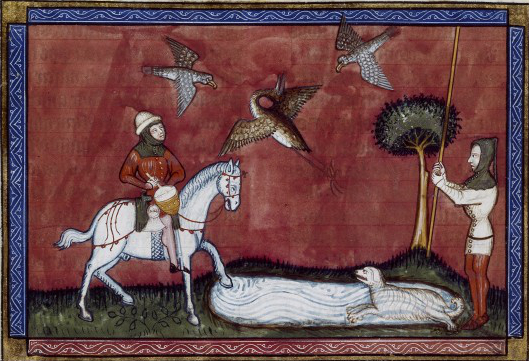 It could be made of silk or leather, Edward of Norwich informs us that the best lyams are made of White (tanned with fat, tawed) horseleather. The ‘race’ lymer gets its name from being used on a lyme. 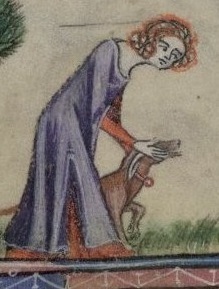 A hound was said to carry his liam well when he just kept it at proper tension, not straining it. Sometimes the dogs where leashed together two by two. 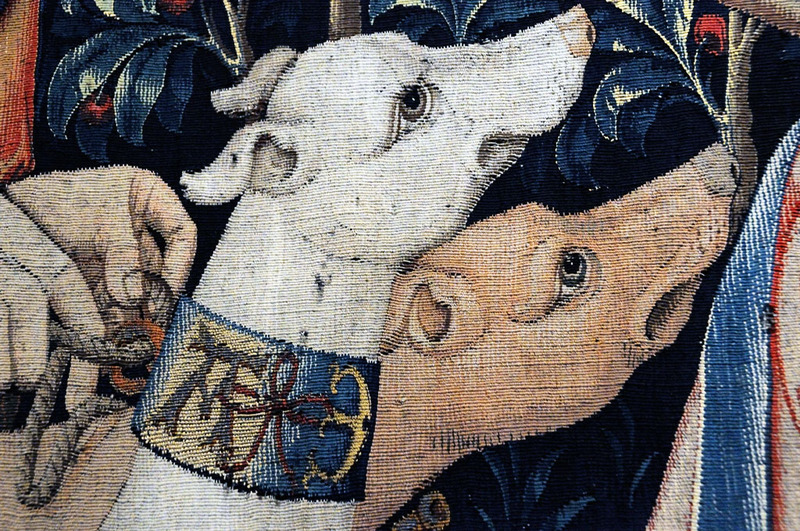 Edward has some smart advice about how a couple should be fashioned: “And also he (the boy who cares for the dogs) should be taught to spin horse hair to make couples for the hounds, which should be made of a horse tail or a mare’s tail, for they are best and last longer than if they were of hemp or of wool. 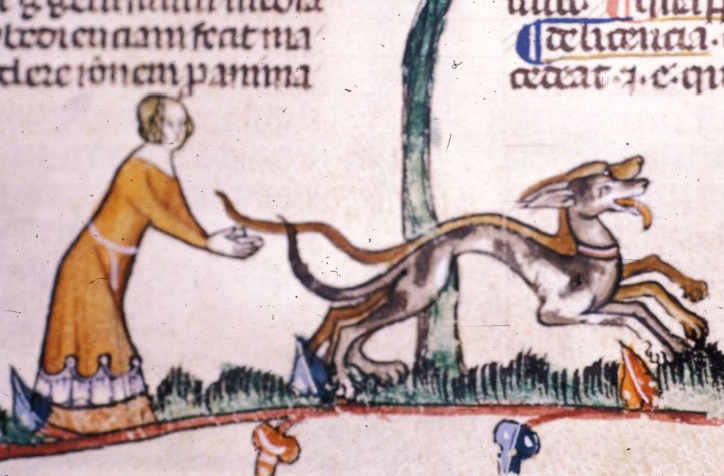 And the length of the hounds’ couples between the hounds should be a foot .” It seems this is mostly used on raches. Ordinary ropes, or at least what looks like ropes, is seen quite alot in the illuminations. While it is possible these are made of horsehair, silk and all the other suggestions and recommendations, I find it rather believable that some are of ordinary hemp. As Edwards say that hemp is not as good as the others, it is a indication towards hemprope being used. 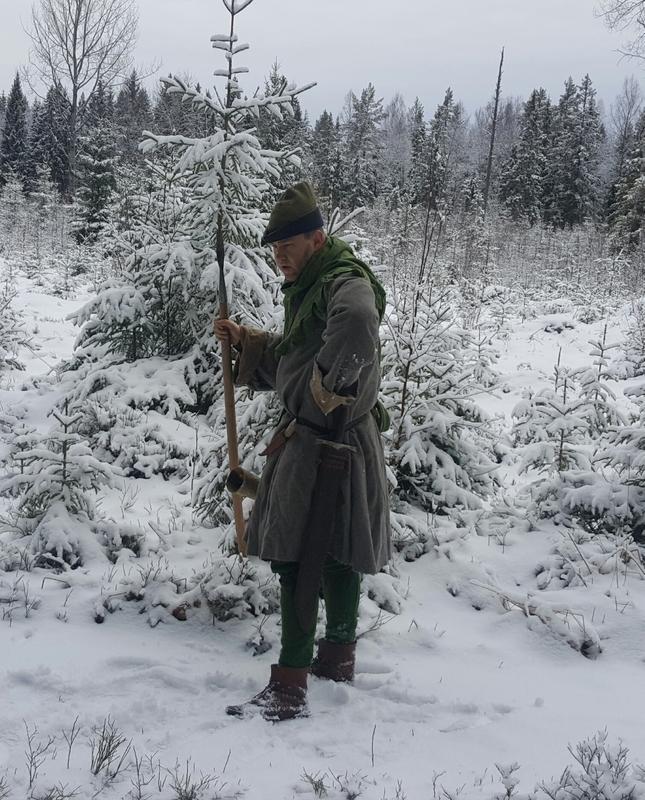 Linen might of course be used as well, but all that has used linen ropes know how hard a knot is to get loose if it gets wet…. 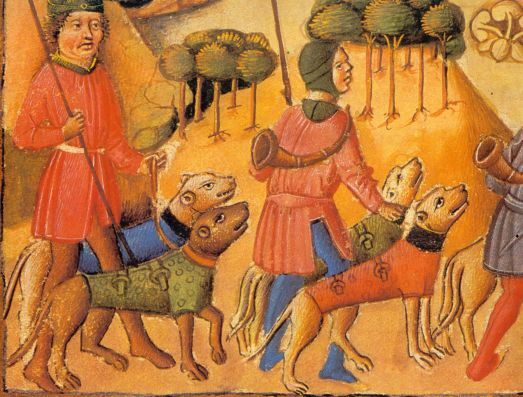 The use of leash and collar is similar to those use today, but there are some tricks of the trade they medieval berner used. 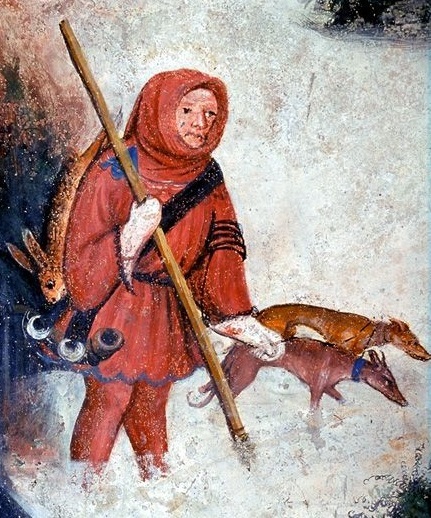 Hunter from Castello Buonconsiglio,1410, with the leash around his upper arm. To have the use of the hands free it is common to see Berners twisting the leash around their upper arms a couple of turns, thus gaining the use of the hands to carry things in or handling things with. It keeps the dogs safely secured and even big dogs are rather easy to handle in this way. 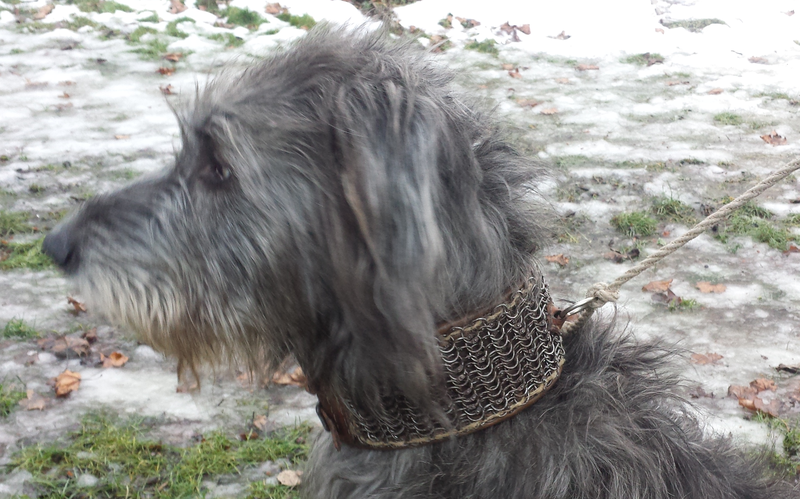 It is a smart way to keep the use of the hands free while having a leashed hound. This technique also seems popular when you double the leash up. Often you see dogs, especially Raches coupled up. this was done by putting a leash between two dogs. 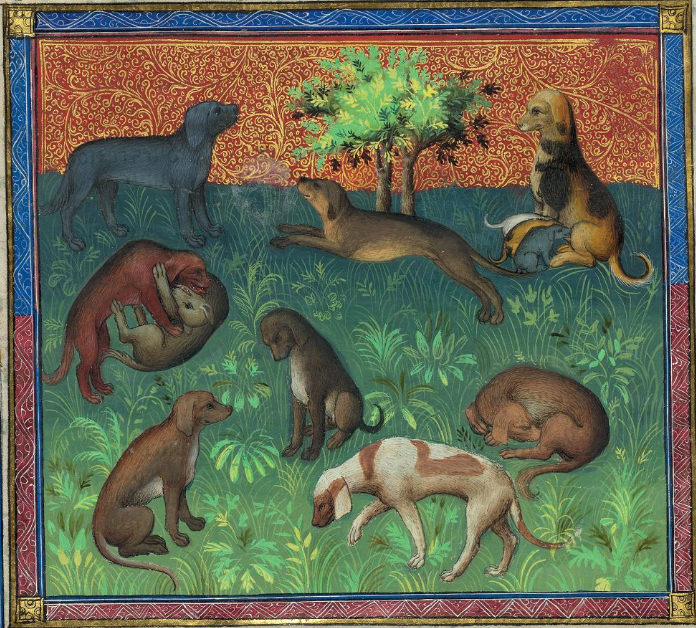 Coupled up dogs could be gathered up together in a hardle, consisting of 8 dogs. When set on the game they where then usually uncoupled, although one sees still coupled dogs running after prey in illuminations. There is some thoughts about that a ‘firm’ older dog was coupled with a more inexperienced young dog, hence making a sort of Learning Couples. 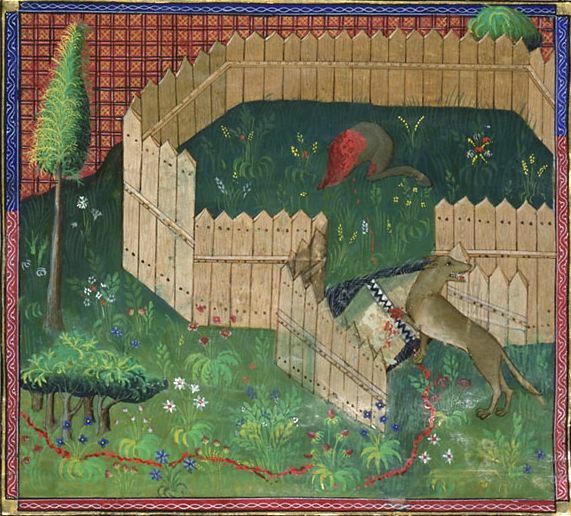 Removing the collar when releasing the hounds seems to be fairly common. 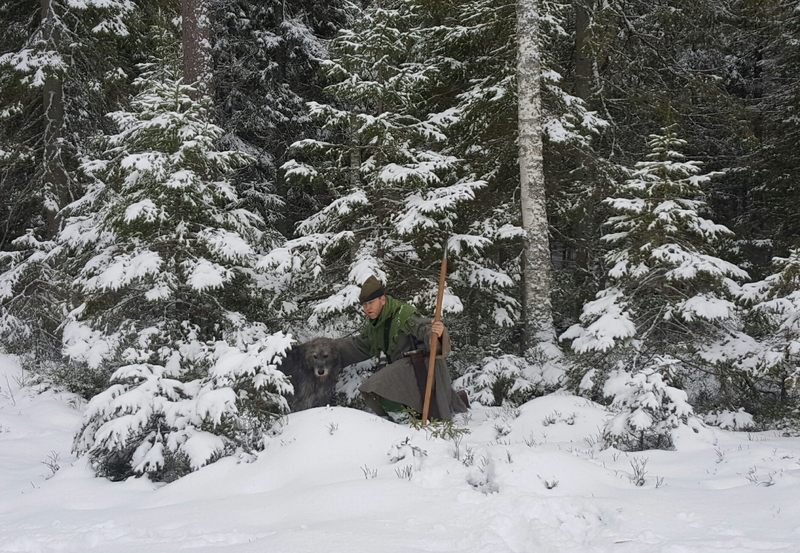 You see dogs released on the prey without collars, and also berners (doghandlers) with several collars hanging from their arm. 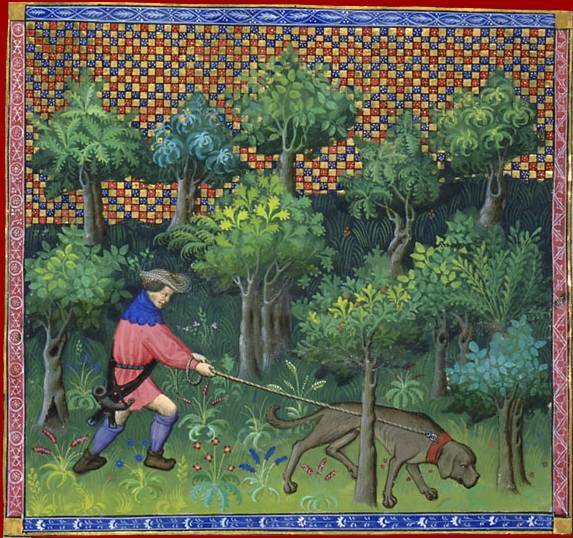 Maybe this was done to lessen the risk of the dog getting caught in the under-brush. 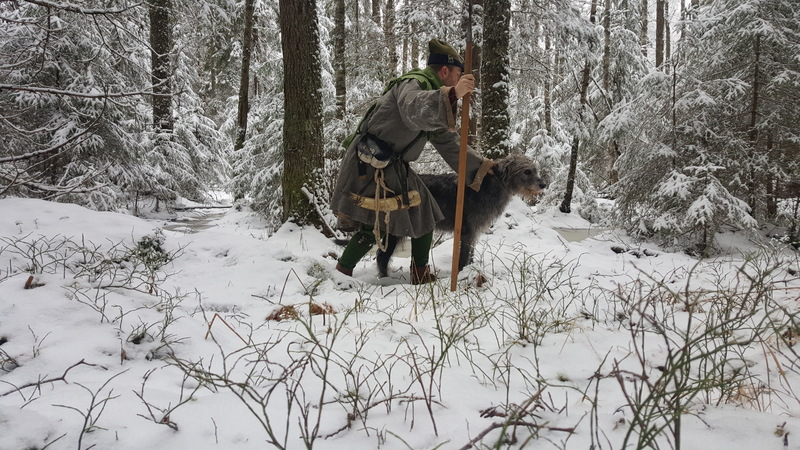 Pulling the rope through the ring in the collar and then back to the hand, thus doubling is not that common, but it does exist and it is a very good way to hold a dog when you are about to slip it. 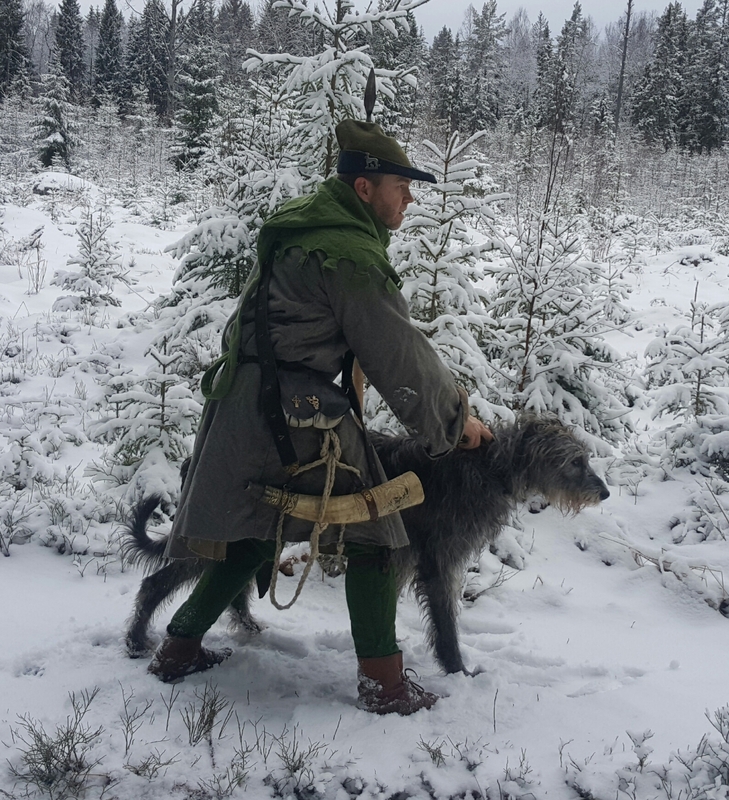 It is harder to hold it firm when the dog pulls though as dropping one end of it will make it run trough and the dog bolting. Thus it is mostly used with tying one end to the arm. 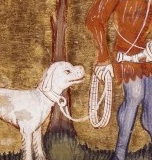 A hunter from 1455, doubling up the rope to two dogs. 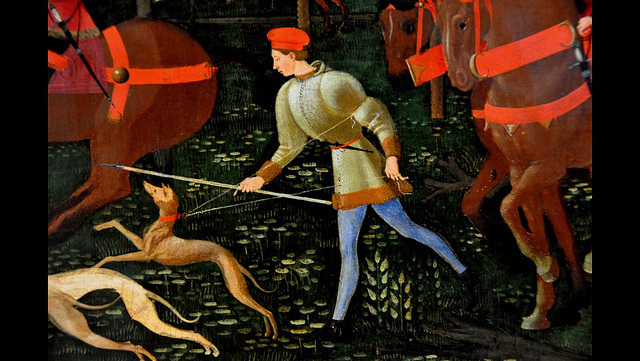 Veltrahus from Ucellos ‘the night hunt’ 1470, the leash tied to his arm and doubled through the collar. When you have a leash, and a collar, there comes a point when you need to connect the two to each other. The most common way seems to be to a ring at the collar. This is often attached directly at the collar. Sometimes it is set in the space between the ends of the collar. 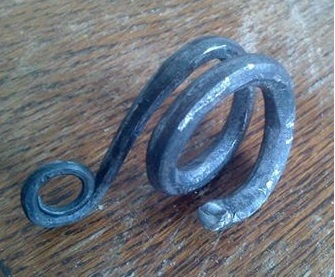 But the way to connect the rope to this ring or swivel is not always that easy to figure out. I decided to make one anyway, just to try if it was actually any good. 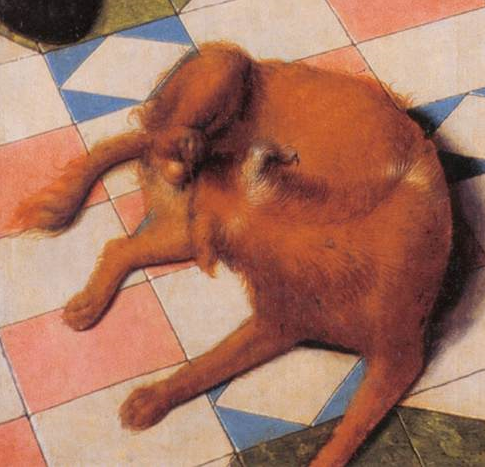 My experience is that it had a tendency to unscrew, leaving the dog all of a sudden plodding along on its own. This kind of undermines the whole business of leashing the hound. 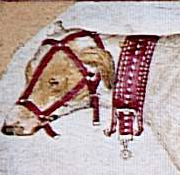 It is also often faster to just tie the rope or remove the collar. There are some illuminations that seems to show that the leash is just permanently attached to the collar. 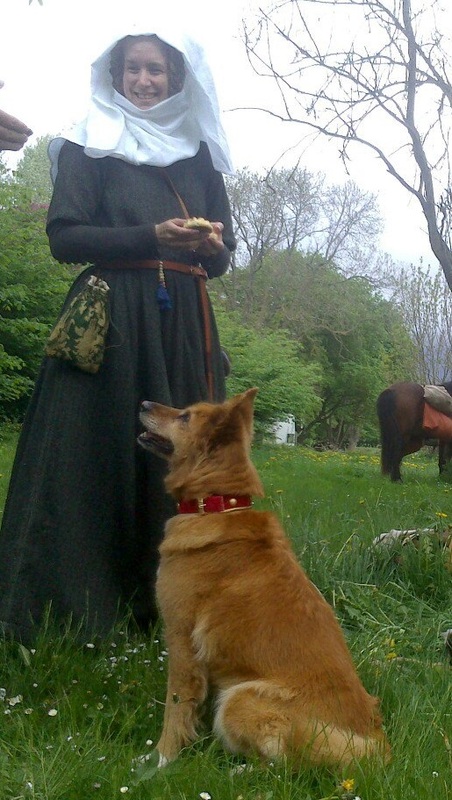 There is no need to actually be able to untie for example a lymer, if it is always held on a leash when out. Also, as it seems fairly common to remove the collar on release the need to remove the leash is little in those cases to. Probably the most common, and also the one I found works best. It could be a bit of a bother to get off fast, but if that is not really needed, then it works well. This is the solution I mostly use myself. These seems to be of the same type mostly, they all consists of leather straps holding the snout closed. I have seen none that uses a basket over the mouth. 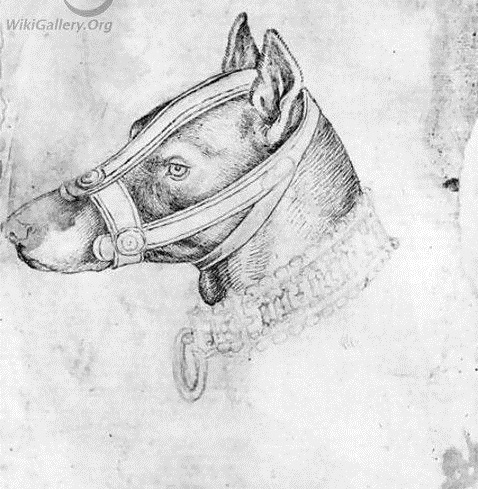 Evidently mostly dogs that might have a tendency to bite had these, alaunts being treated to a muzzled more often. 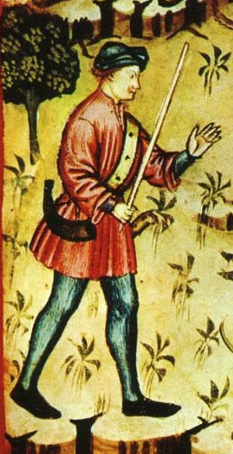 The berner is often shown carrying a stick. Sometimes you are also advised to cut a stick or a switch. 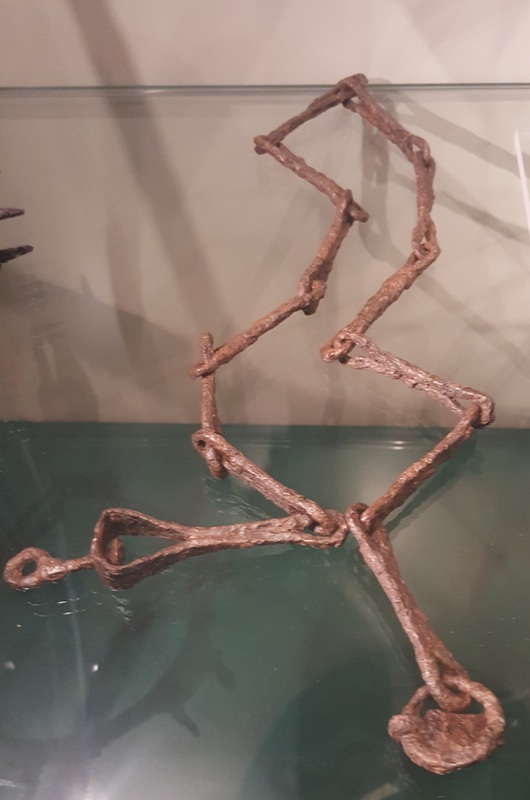 This was a stick used to punish and chaste the dog. You beat the dog if it did wrong, or if it did something you wanted it to stop with, for example if you wanted it to stop biting/eating the prey after catch. 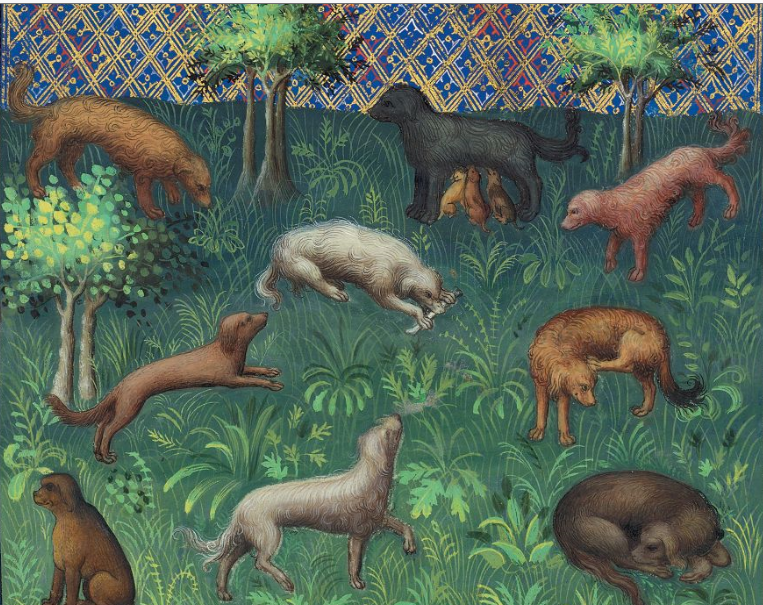 In Tristan and Isolde they also say they beat the dogs on the paws with hazelswitches to get them excited before the hunt. 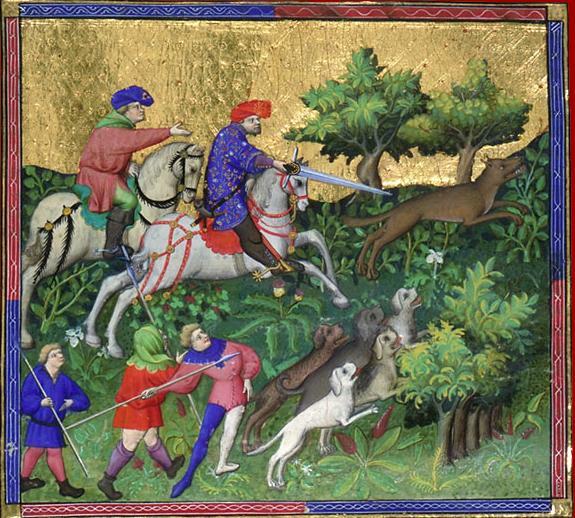 Beating the dog is a brutal and not very efficient way of training dogs that Exploring the medieval hunt does not condone. It is a savage custom that unfortunately still is used by some. 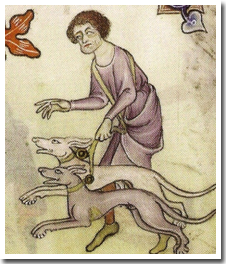 In the medieval days it was an accepted practice though, and even beating the young boys who where serving at the kennels was recommended. Do not beat your dogs. 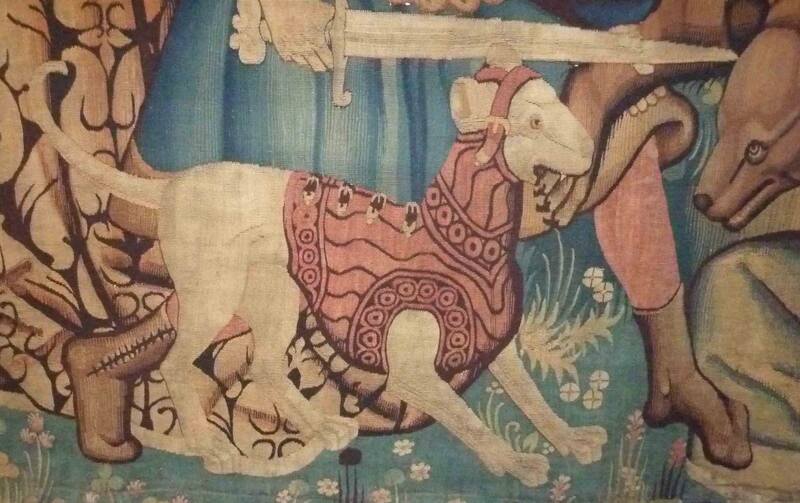 The dogs in armour always provoke the imagination of us modern people to run wild. 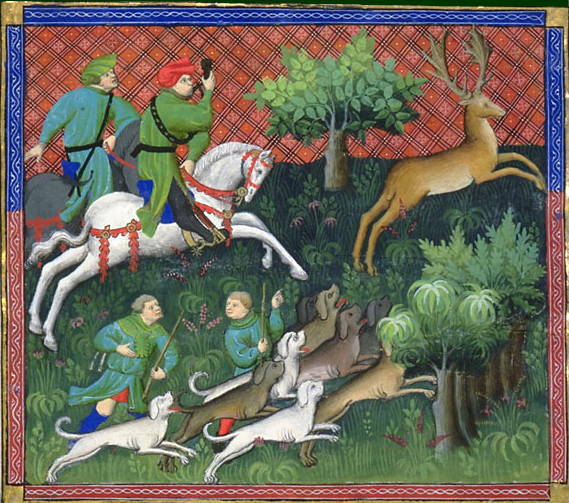 There is little written proof of the armoured dogs, in the most common huntbooks it is not mentioned at all. There are pictures of it though. 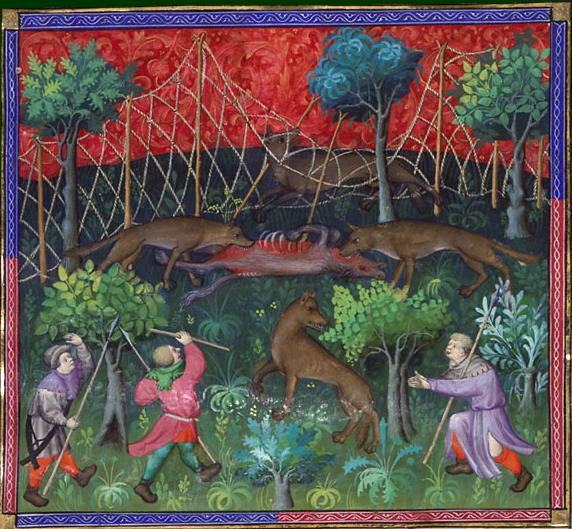 We see dogs hunting boars in Spain wearing them and also on tapesteries hunting bear. 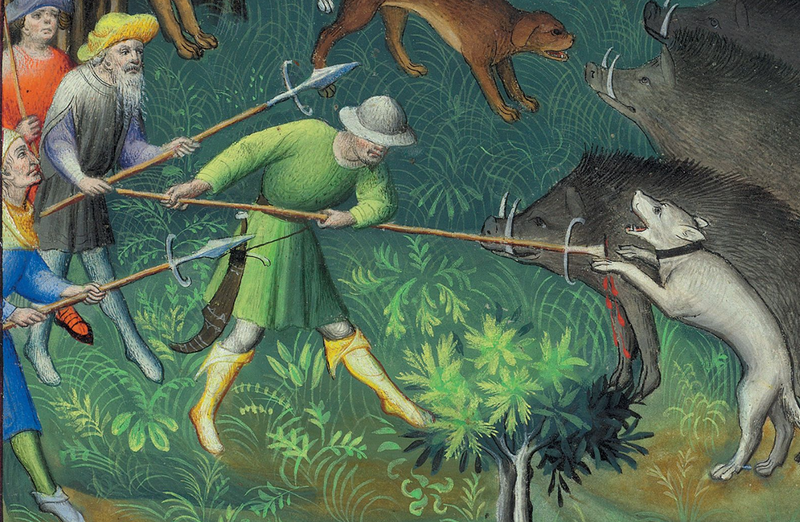 The use of armour would be when hunting prey that would be dangerous to the dogs, mainly bear and boar. 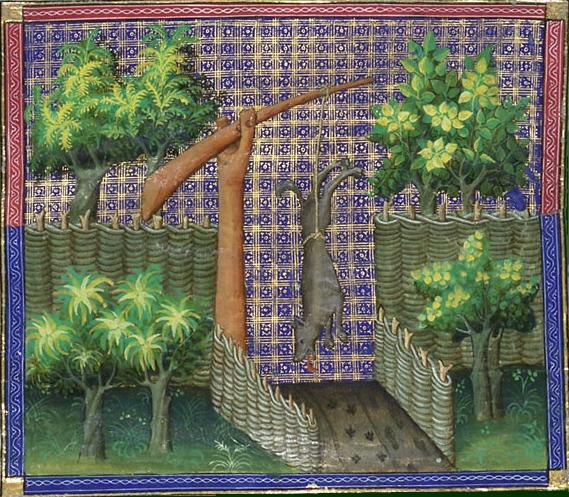 Technically the antlers of a hart would be just as, of not more fatal, but it seems one did not use armour here. This is probably because of the speed-reduction it would impede on the dog during the chase. 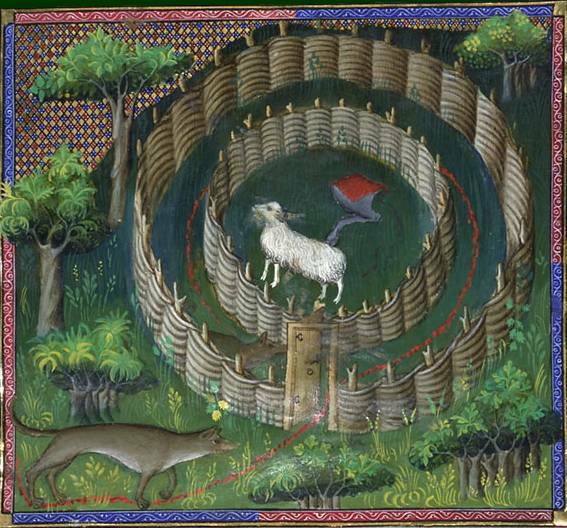 Boars and bears are not as fast and therefore one could afford swapping speed for protection. 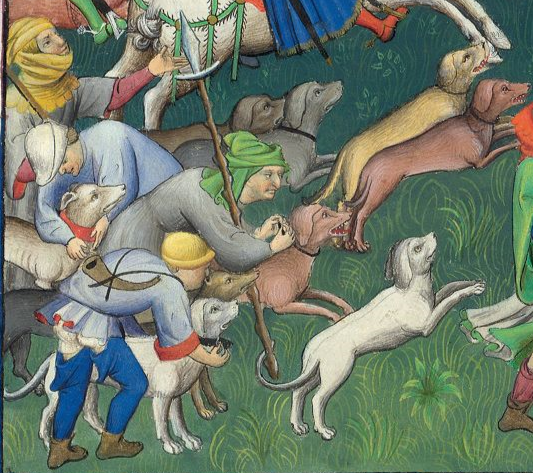 The use of bells on the collars for the dogs might have been purely decoration, or it had the purpose of making the movements of the dog easier to follow when it is running around. 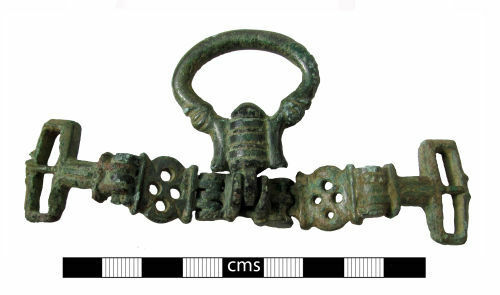 The bell seems to have been attached either on the collar, or at the end, on the strapend. This article have been browsing the tools of the doghandler. It is our hope it will awaken your slumbering researchspirits and make you throw yourself out into the world looking att stuff. We hope it has pointed out some things one can look at, and maybe help you interpret what you see on pictures and in artefacts on museums. 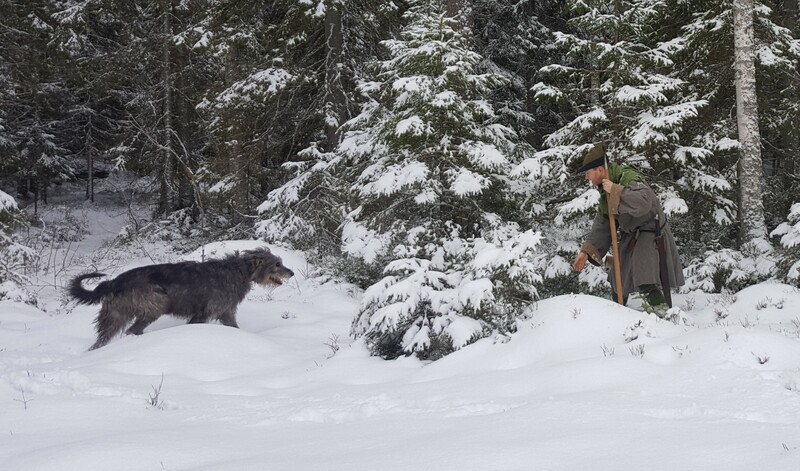 As followers of our Facebook-page already know, our pack has been reinforced with another hunter. 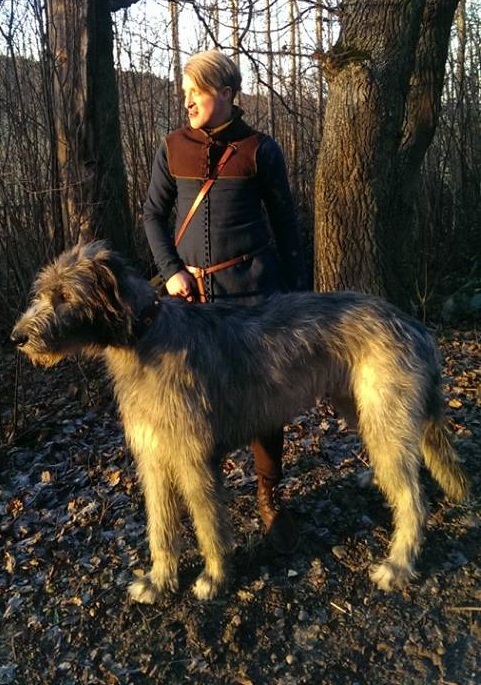 Our new companions name is Basilard, he is a one and a half year old Irish wolfhound and was adopted by Emil. 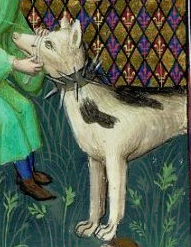 Basilard trying out his new medieval-style collar. 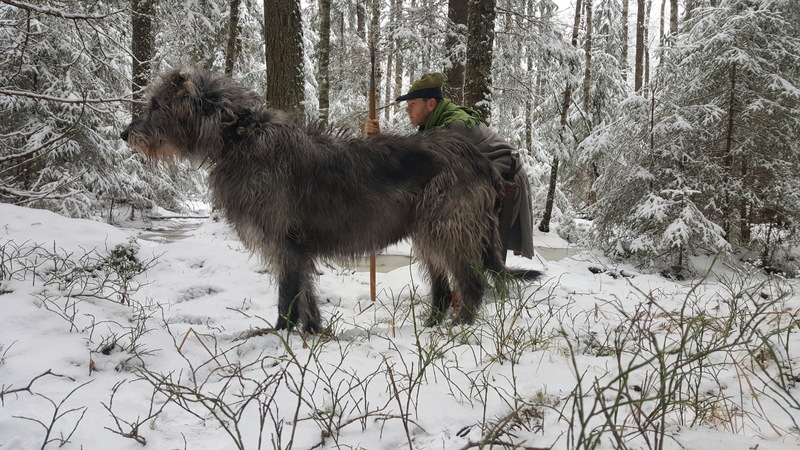 Basilard is not fully grown and much thinner than we want him, but already a big boy with his 56 kilos. Just like Johans Boudica and most other sighthounds, he is a bit reserved towards strangers at first. But as soon as he gets to know someone, he wants to get close and cuddle up, offers a big tummy to rub or a wet kiss – he is possibly the biggest lap dog in the world! Basilard was “rescued” from a home where he did not get the love and care he should have had. Because of that, he came to Emil as a youngster and has a lot to learn. A calm, brave and warm personality, he is eager to please. 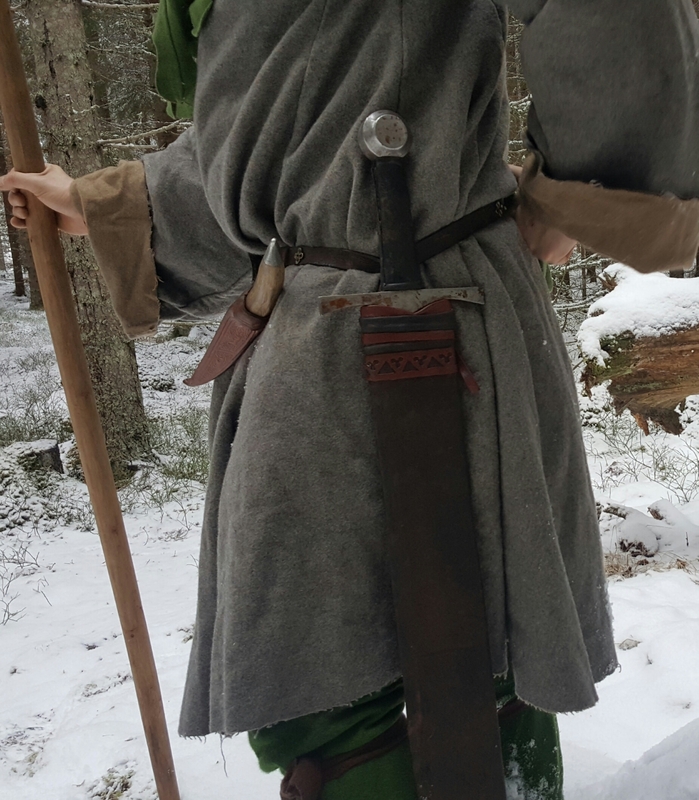 When he spots a hare, you can tell Basilard wants to be a great hunter, but he is yet to early in his training to be allowed to run free. Currently Basilard is busy making friends with Boudica and getting used to his new family, but he is settling in just fine and we have great hopes for him. About the name – a basilard is a medieval type of dagger, almost a short sword characterized by its wide blade and H-shaped handle. It is both a good tool and a powerful weapon of some status, but one you keep close to you. I guess I’ll have to make one for myself now, for reference.